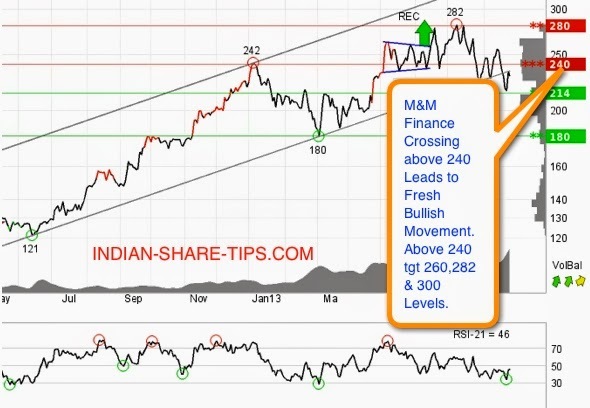 M&M Finance had broken the channel on the downside and now it is again at the resistance level of 240 which if broken means that stock heads to the level of 260,282 and 300 levels. Have a look at the chart below for further amplification and strategy. One can be long in the stock with a strict stop loss of 239.8 and all those with deep pockets can have a deep stop loss of 212 level. This analysis is made on 29 Aug 2013. Just remember last time also we had covered M&M Finance Trading Tip & Traders & Investors earned good amount of profit. You can check it out by clicking the above link and that time stock achieved a high of 285 and reversed. So, in this upmove again 285 will become a stiff resistance. So, watch out now for the long opportunity. Just wanna make money like our subscribers who hold stocks then do not forget to check our short term delivery tips here. Happy Trading & Make Profit with us in Intraday by using the best intraday tip which finishes by 11:30 AM in the morning.